Growing up in England, this ice cream was a childhood favorite. A note from my sister about my grandmother reminded me that she would make mint chocolate chip ice cream for us. So this is a little tribute to her. 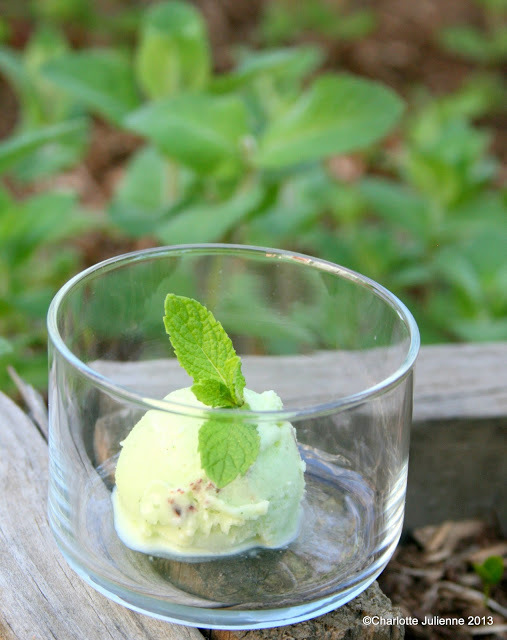 The mint in our garden is thriving this year, so this ice cream is not only delicious, but also uses some of our own produce. We love it when we can use something that we have grown ourselves. First you need to make some ice cream base. In a pan combine 600ml of whole milk, 200ml of cream and 200g of sugar. Then heat gently until all the sugar is dissolved. Meanwhile separate 6 eggs. (Keep the whites for another use). Break the yolks then temper them with a little of the hot cream milk sugar mix. Then combine all the ingredients together and heat whilst stirring constantly. Once the base is thickened enough to coat the back of a spoon, remove it from the heat and allow it to cool. Once the base is cool place it in the fridge. Pick several handfuls of fresh mint (a great way to get kids involved in cooking). Wash and dry the mint leaves then place in a blender. Add the base from the fridge and a drop of green food coloring. Then wiz on high. Strain the mix trough a fine mesh sieve. Add a 1/4 cup of semi sweet mini chocolate chips. Churn the ice cream then place in a container and leave to set up in the freezer. The fresh mint flavor is so refreshing and then every so often you get a morsel of chocolate.